Man oh man. Here we go again for another week of putting pencil to paper. Sketchin’. Doodlin’. Drawin’. Whatever you call it, we’ve got just what you’re looking for. Fancy hand lettering? 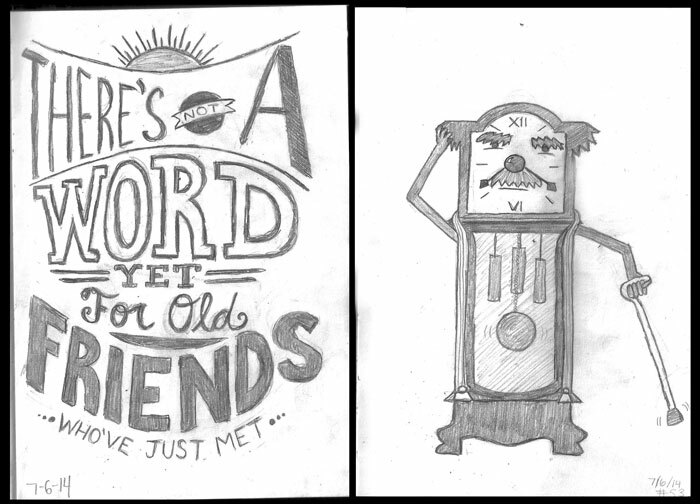 Anthropomorphic Grandfather clocks? Pregnant Dinosaurs? WE’VE GOT IT ALL! Check it all out below and see all of this week’s madness! Day 50: Fifty days already?!? 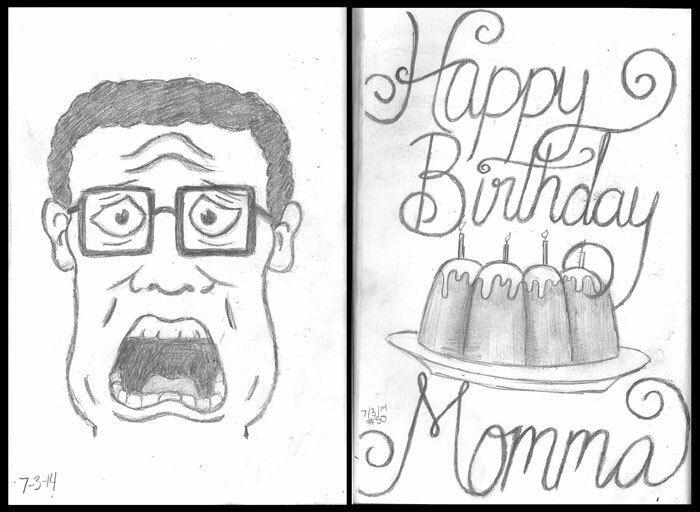 BWAAAHHH!Hank Hill’s reaction pretty much sums up Sean’s feelings on the daily sketches. The day before 4th of July also happens to be Stef’s Mom’s birthday, so she drew a scrumptious bundt cake with some festive typography. Day 51: Happy Independence Day! 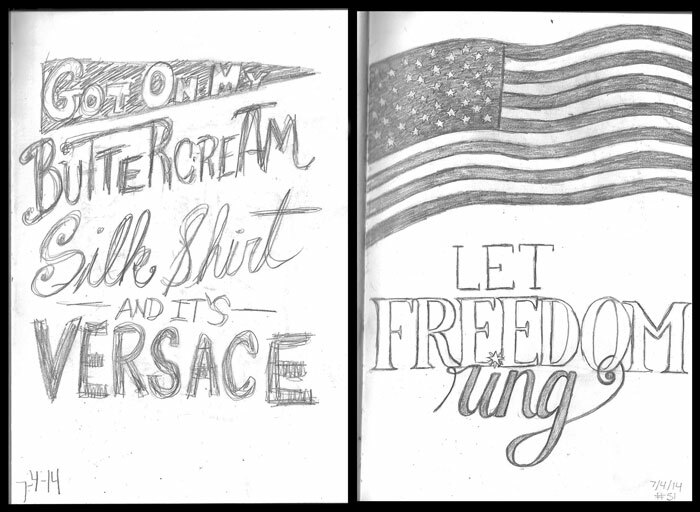 Sean probably had a little too many Budweiser’s at the party today and drew a very rough lyric to a Frank Ocean song, while Stef shows her patriotism with an American flag waving in the breeze. Day 52: Watch out! It’s a Preggosaurus! Sean draws a dinosaur that looks like it’s about to burst. 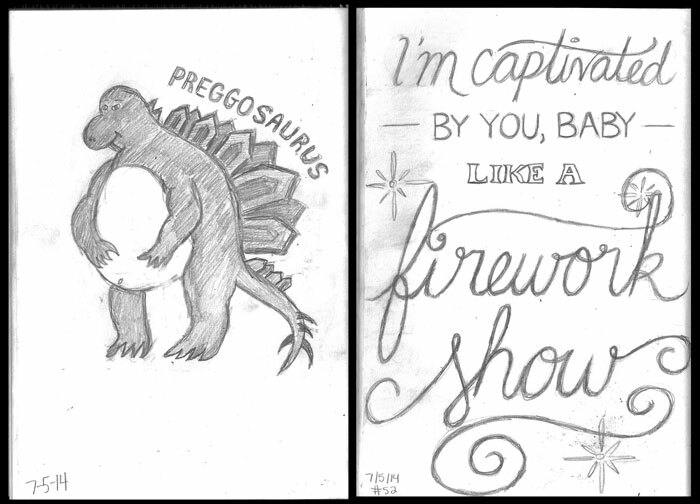 Stef, still in the 4th of July spirit, takes a lyric from a Taylor Swift song and adds some dazzling fireworks to it. Day 53: Having just heard Gonzo’s ballad from the original Muppet Movie, Sean does some really nice hand lettering (which might get put onto the computer soon). Stef brings life to a Grandfather clock that looks like it could fit in nicely in the Muppet universe. Day 54: On this particularly hot day, Sean sketches the lyrics to a favorite song of his by XTC. 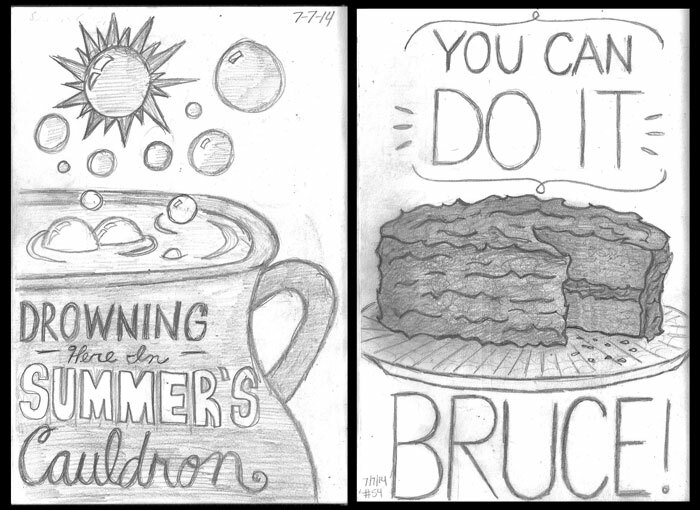 Having just watched the childhood classic Matilda, Stef draws the enormous chocolate cake that was devoured by Bruce Bogtrotter. YOU CAN DO IT BRUCE! 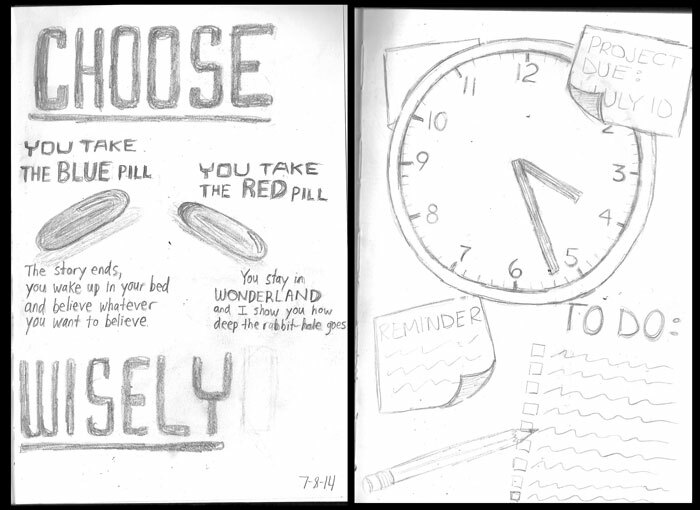 Day 55: Sean draws the iconic scene from the Matrix and goes deeper down the rabbit-hole, while Stef stays in the real world and takes out her work stress with some deadline-dealing drawings. Day 56: ***Theme: BALLOONS! *** Feeling like his head is in the clouds, Sean wonders what it would be like to have a head full of helium. 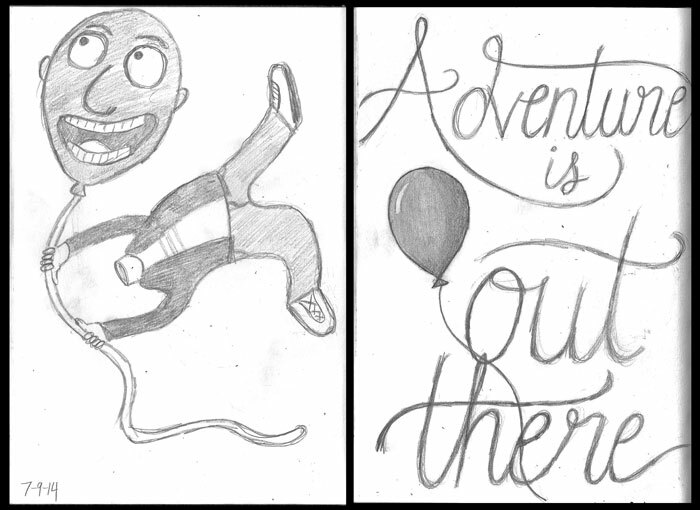 Stef borrows a line from one of her favorite movies and draws some Up inspired typography.